That’s OK, Cruz Azul and América are only the Apertura favorites right now! Next Monday, the Los Angeles Rams are set to “host” the Kansas City Chiefs in an NFL game at Mexico City’s Estadio Azteca. However, the league is reportedly looking into moving the game back to LA because the field, quite frankly, looks like a case of hellfire diarrhea. Last May, the legendary stadium switched its pitch from natural grass to a hybrid surface, but with both Club America and Cruz Azul utilizing the Azteca, the grass has been a constant source of anxiety over the last few months. Back in October, the state of it all came to a head following a pair of Shakira concerts at the venue. This was also around the time of some record rainfall in the city. And things have only gotten progressively worse over the past month. Last Wednesday, the Azteca hosted another concert which tore the pitch to shreds. Then, on Saturday, Cruz Azul hosted Lobos on the ridiculous surface. Just wait until you see the north side of the field. 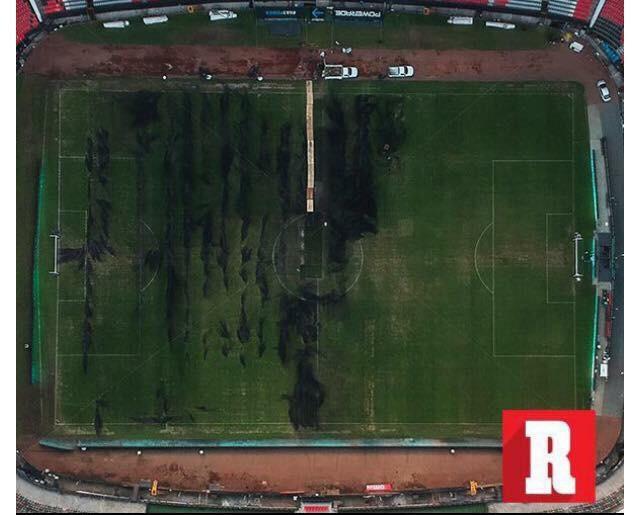 The field admittedly looks better now with the NFL putting all its clout into making sure things go ahead on Monday, but how will it look when América hosts Veracruz on Nov. 24 to complete Apertura regular season play? Estadio Azteca on Saturday vs. this morning. Still 6 days until Chiefs-Rams. It’s getting there. And it’s absurd because “the next tournament” that Caixinha is referencing is the Liguilla (the Apertura playoffs). Cruz Azul tops the table with 33 points and América sits second with 30. Both have already clinched their places in the playoffs, so both are guaranteed at least one home match at the quarterfinal stage. The NFL might manage to pull off the Monday night game, but it’s only going to be to the extreme detriment of Liga MX.